Defending Britain’s outpost in the Pacific ... Fijian soldiers on the march in Levuka 1915. November 11, 2018 will mark 100 years since the end of World War 1. The signing of the Armistice on 11 November 1918 ending the war was a cause for great celebration throughout the British Empire. While the news was welcomed by many, especially servicemen and women, many were still coming to terms with the sacrifice and sorrow of the loss of loved ones in the war. The final months of the war saw the Allied forces engage in what is referred to as the ‘Hundred Days Offensive’ that paved the way for the Armistice on 11 November 1918. History records that in March 1918 the Germans mounted a series of attacks against the British sector in the hope that the British and French would surrender before the Americans arrived in numbers to bolster the Allied war effort. The Germans threw everything at the Allies, including the proverbial kitchen sink. As the German advance began to wane, British and French forces launched a counter-offensive that began with the Battle of Hamel on 4 July 1918. The Australian Corps under the command of Australia’s, Lieutenant-General (Lt-Gen) Sir John Monash, attacked Hamel with 7,000 Australian and 1,000 American soldiers. In capturing Hamel, Monash used the ‘combined arms’ attack which involved the close coordination of the infantry, tanks and artillery working close together. Prior to this, armies were bogged down in the static slugfest of trench warfare which reflected conventional military thinking at the time. The Battle of Hamel with its multi-faceted and fluid approach requiring the close co-operation of tanks, infantry, artillery and air force, became the template for future epic battles used by the Allies against the Germans who still clung to the idea of the static defence. Almost one month later, on 8 August 1918, in what is known as the Battle of Amiens, 100,000 Allied troops of the British 4th Army which was made up of the Australian Corps, as well as large military formations from Canada, America, Britain and France, stormed a 20 kilometre stretch of the German defences near the French village of Villers Bretonneux. The battle was spearheaded by the Australians under Monash. The battle raged for four days before victory was secured. The Allies suffered over 21,000 casualties in that battle. The victory at Hamel and Amiens put the Allies on the front foot. The final goal was the last line of German defences dubbed the Hindenburg Line. It was to be the final battle in the ‘Hundred Days’ Offensive. History refers to this final battle as the Battle of Montbrehain. It commenced on 29 September 1918 and was preceded by three days of artillery bombardment. 150 tanks and Australian, British and American infantry Divisions were involved (Division = about 12,000 men). The Australian 3rd and 5th Division broke through the last line of German defences. They were followed up the Australian 2nd Division which punched through to capture the key town of Montbrehain beyond the enemy front lines. The Australians suffered 34,000 casualties. With their defences in disarray, the Germans sued for peace and the Armistice ending the war was signed on 11 November 1918. World War 1 saw battlefield slaughter on an industrial scale. The scale of casualties beggars belief. Australia alone lost over 60,000 men. Britain and France lost over 1 million. Even India which fought as part of the forces of the British Empire, lost 70,000 men. In his book Men at War, writer Ernest Hemmingway described World War 1 as “…the most colossal, murderous, mismanaged butchery that has ever taken place on earth”. Fiji’s contribution to World War 1 pales into insignificance compared to larger countries like France, Britain, Australia, New Zealand, Canada, the USA and India etc. It was indeed a very modest contribution (Fiji’ contribution is detailed in a book by Christine Liava’a titled Qaravi Nai Tavi: They Did Their Duty- Soldiers from Fiji in the Great War). 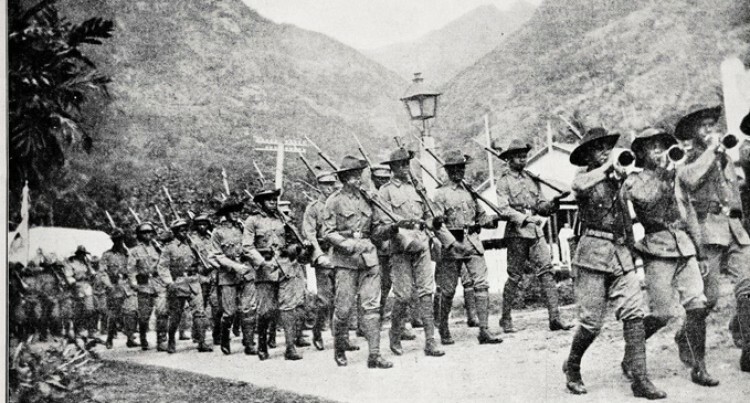 More than 1,200 men and women from the fledging colony of Fiji enlisted for war service. 357 of these served under the Fiji flag with the Kings Royal Rifle Corps (KRRC) of the British Army. Another 101 iTaukei men led by European officers and NCOs formed the Fiji Labour Corps and served in the logistics chain in France and Italy. Also, two nursing sisters from Fiji found their own way to Britain and served as military nurses in hospitals caring for war casualties. Sadly, 180 men from Fiji lost their lives serving with the Fiji contingent in the British Army as well as with Australian and New Zealand forces. They were buried with their fallen comrades in foreign fields far from home. One Fijian soldier of the Fiji Labour Corps, Private Wiliame Vakaotia from Lamini village on the island of Taveuni, died at sea on the return journey back to Fiji. In a moving ceremony on board the ship MTS Kia Ora, Wiliame’s body was committed to the cold, dark depths of the Atlantic Ocean to await that glorious morning when mankind will all rise to the final trumpet call of Judgement Day. For a small colony like Fiji, any death was one too many. Insignificant as it may seem, the loss of the 180 men from Fiji left an indelible scar on the small Fiji population.